spelling “composition” correctly. During the competition, she also correctly spelled: voortrekker, subterfuge, insidious, illusion, altruism, ruckus, inconvenient, triathlon and siege. The second-place winner, Alex Le Helloco, successfully fielded words including: perestroika, ridiculous, alderman, laboratory, patriarch, unduly, referee and fascinate. Each winner received a trophy and a complimentary annual family membership to the American Library in Paris. Fifth-graders Emma Mieszala, from Lycée International Saint-Germain-en-Laye; Wazeen Karkachi, from École élémentaire Louis Pasteur; and Alex Ravel from École Jeannine Manuel tied for third place. The three spellers lasted through round 17. Fifth-graders Elliot Gampel from École Massillon and Emily Baily from École Jeannine Manuel tied for fourth place in round 17, while Hanif Caesarian, from École International Bilingue – The Victor Hugo International School; Siddharth Chaitra Vivek, from École Jeannine Manuel; and Akanksha Rai, from the International School of Paris tied for fifth place in round 15. “The finalists were well-prepared, poised and they looked like they were actually having a little fun,” said Helen Sahin Connelly, coordinator of the event. The early Sunday morning event began with fresh coffee and tea from Starbucks and snacks and juice from Marks & Spencer. Each contestant took home a medal, a certificate and an American Library in Paris tote bag containing a book and gifts from the Bilingual Connection, Marc Labat, the Bilingual Acting Workshop and Sobral. The Paris Spelling Bee is a community enrichment event organized and sponsored by Gifted in France in collaboration with the American Library in Paris. The pronouncers were Library director Charlie Trueheart and Anne Swardson, editor-at-large at Bloomberg News. 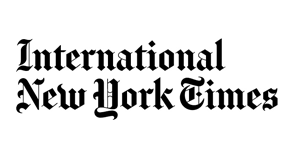 Words for the Paris Spelling Bee’s Oral Finals were taken from “Spell It!” an official study guide published by the Scripps National Spelling Bee in the United States in cooperation with Merriam-Webster, Inc. The list is often used in regional spelling bees in the United States and features US spelling. Additional words were taken from Brain Facts Book, A Primer on the Brain and Nervous System. This book is one of the official study guides for the International Brain Bee (IBB), a worldwide neuroscience competition for high school students, which is hoping to start a chapter in Paris. Paris Spelling Bee events will resume in the fall with “Language Comes To Life” workshops for children at the American Library in Paris and a family pizza movie night featuring the film “Akeelah and the Bee.” To sign up for updates about the 2016 Paris Spelling Bee, please email parisfrancespellingbee@gmail.com, or use the ‘contact’ page on this blog. Special thanks to the organizing team: Helen Sahin Connelly, Kim Siew Ngoh, Ashley Miller Benz, Jenny Bateman-Irish, Karen Simpson, Jude Smith Matisse, Pauline Lemasson, Celeste Rhoads, Naida Culshaw, Shannon Connelly and devoted volunteers Laetitia Nail, Jan and Scott Smith, Loretta Fox, Clarence Tokley, Janet Sahin, Amy O’Hara, Julia Connelly and Frank Connelly. Congratulations to each of our 2015 finalists, and to all the students who participated in the Preliminary Written Round in January. Seventy-two spellers in grades CM1-6ème (4th-6th grade) packed a gymnasium at the Ecole Sainte Catherine in the 5th arrondissement early last Saturday morning to participate in the 7th annual Paris Spelling Bee’s Preliminary Written Round. Contestants from over 35 schools (including 20 public schools) in Paris and the surrounding area registered for the Preliminary Written Round. Of the 80 registered contestants, 72 made it to the event. The Preliminary Written Round consisted of 25 words drawn from a study list provided in advance to participants plus 10 words not from the study guide. 21 finalists were selected based on the total number of words that they spelled correctly out of 35. We would like to congratulate all the students who registered, studied and participated in the Preliminary Written Round. Each speller received a certificate of participation to acknowledge his/her hard work in preparing for and completing the written round. 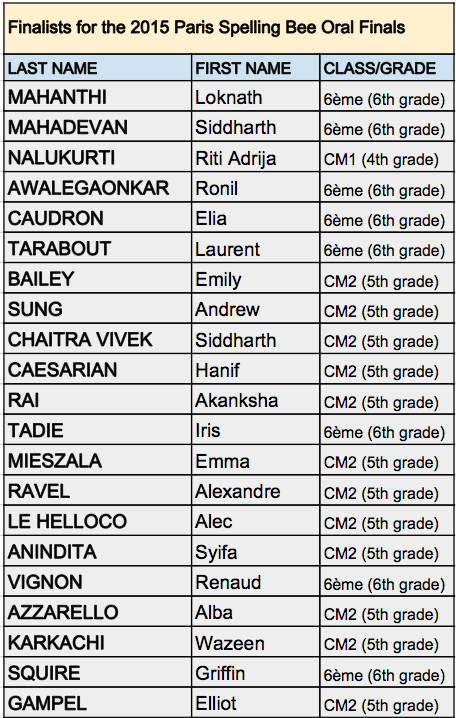 Below are the spellers who qualified for the Oral Final Round of the 2015 Paris Spelling Bee. Finalists needed a score of 32/35 to qualify. The Oral Final Round will be held on Sunday, 15 March 2015 (09h00-12h30 approx) at the American Library in Paris. IMPORTANT: Finalists will have until Thursday, 29 January at 19h00 to confirm by email to parisfrancespellingbee@gmail.com their participation in the Oral Final Round of the 2015 Paris Spelling Bee. They must also pay their registration fees, as indicated on the registration form. A new study list for the Oral Finals will be sent by email to all finalists by 13 February. A mock (practice) session will be held for all the finalists on Sunday, 8 February (09h30-11h30 approx.) at the American Library in Paris. At the mock session, finalists will learn useful tips on oral spelling bees, review contest rules and have a chance to meet fellow participants. As the spellers prepare for the finals, we would encourage them not only to memorize the words, but also to learn their meanings and their origins. We are grateful to the sponsors of the Paris Spelling Bee! Thank you to the American Library in Paris for generously providing use of the library for the mock and final rounds of the spelling bee, for offering staff support during all phases of the bee and for furnishing supplies. Thank you also to Starbucks for supplying hot drinks and pastries to all the contestants and their parents at the Preliminary Written Round and to Bilingual Connection, for donating the trophies for the spelling bee winners. A big thank you to the Spelling Bee Team and volunteers for making the Preliminary Round possible: Ashley Miller, Kim Siew Ngoh, Pauline Wong-Lemasson, Karen Simpson, Jenny Bateman-Irish, Naida Kendrick Culshaw, Shannon Connelly, Jude Smith Matisse, Jan Smith and Amy O’Hara in the US. Special thanks to Laetitia Nail and Loretta Fox for managing the registration desk once again on the day of the event. Thanks also to Celeste Rhoads, Minette Juric, Chiew Terrière, Josh O’Donovan and Padma Prat. Heartfelt thanks also to Mme Florence Dollé, Directrice of the Ecole Sainte Catherine, and her assistant Mme Deletang, for their support of the Bee and the use of the venue. Last, but not least, thank you to all the parents who brought their children to the Preliminary Round on a cold and early Saturday morning, and patiently waited until the end. The Paris Spelling Bee is an annual community enrichment event organised by Gifted in France in collaboration with The American Library in Paris.